Good genetics and proper diet are important parts of a strong immune system. If your cat's immune system is working properly, it's fighting a variety of invaders to keep her healthy. This complex system identifies foreign substances such as viruses, parasites and bacteria, and eliminates them from her body. If her immune system is compromised, she's at risk for a range of ailments. Kitty's immune system is divided into two parts, innate and adaptive. The innate immune system is the first line of defense, designed to keep intruders at bay. Kitty's skin, stomach acid, mucus in her respiratory system, and chemicals in her saliva are part of this system. Special cells called monocytes, which consume anything foreign, are also part of her innate immune system. The adaptive immune system protects Kitty from specific foreign invaders, such as particular viruses or bacteria. The adaptive and innate systems work together to protect your cat. For example, if Kitty's exposed to an upper respiratory virus, her innate system will try to keep it from infecting her. If it's unsuccessful, her adaptive immune system will kick in to fight the specific virus that's trying to infect her. If her immune system is effective, she'll successfully fight off the infection without any assistance from you or the vet. The adaptive immune system also has a memory. So if Kitty is exposed to the virus a second time, the response should be faster and stronger to help prevent illness. Kitty has two types of immunity: active and passive. If she is vaccinated for feline herpesvirus, or if she's exposed to it by interacting with an infected cat, the antigens in the virus will interact with the cells in her immune system. B cells make antibodies to destroy the virus, and T cells are activated to help in its destruction. If her immune system is effectively protecting her against herpesvirus, then she has an active immunity against it and her body will manufacture antibodies to protect her as needed. If Kitty is still a nursing kitten, her immunity to the herpesvirus is passive. That means any immunity she's getting is through someone else -- in her case, from her mother's milk. A cat with passive immunity can't replenish its immunity. Once those antibodies used to fight off disease-causing organisms are used up, they aren't replaced. Not all adult cats have healthy immune systems that can fight viruses, bacteria or parasites. If Kitty's system reacts to the wrong antigen, she has autoimmunity. If her immune system reacts too strongly, she's hypersensitive. In some cases, a cat's immune system doesn't respond at all or the response is inadequate; this is immunosuppression or immunodeficiency. 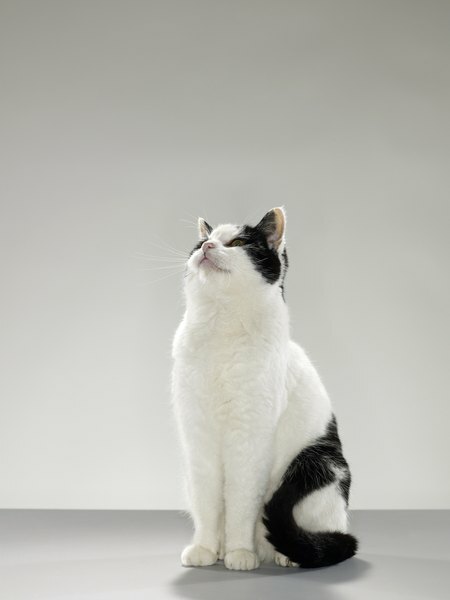 Genetics can play a large part in determining whether a cat's immune system is strong and healthy. Sometimes a viral infection, such as feline immunodeficiency virus, can cause immunodeficiency. Some newborn kittens are at risk for immunodeficiency, especially if they didn't receive enough mother's milk. They are at great risk of becoming infected with a variety of diseases. Poor nutrition, lack of protein and insufficient calories can also suppress the immune system. Several viruses can affect Kitty's immune system. Feline panleukopenia virus, also known as feline distemper, is highly contagious and life-threatening. FPV attacks blood cells and opens the cat to a wide variety of other illnesses. Feline leukemia can have a similar impact, and it can make Kitty vulnerable to the recurrence of previously dormant infections. Feline immunodeficiency virus attacks the immune system and can cause anemia, oral infections, neurologic disease and cancer. Some cats appear healthy despite being infected with the virus, and they are at increased risk of infections. Immune mediated anemia leads Kitty's immune system to destroy red blood cells,. This condition can have a variety of causes, including heartworm, tumors or antibiotics. The best way to ensure that Kitty has a healthy immune system is to set her up for success and keep her out of risky situations. For example, feline immunodeficiency virus tends to be contacted through biting, which can happen when outdoor cats tussle. According to Cornell University College of Veterinary Medicine, indoor cats are much less likely to be infected with FIV. Vaccination can be effective in minimizing Kitty's risk of exposure to illnesses such as distemper and feline leukemia. A healthful diet will also help keep her immune system robust. How Is Feline FIV Transmitted?